In large stew pot cook bacon until crisp. Crumble and set aside. To make roux add flour gradually to bacon grease and stir (whisk) until mixture is medium brown (could omit bacon grease and make water and flour mixture). Add bacon and remaining ingredients except shrimp, file, and rice. Cook for 40 minutes. Add shrimp, cover and simmer for 15 minutes. Just before serving stir in gumbo file or sprinkle on top of each serving. What's a good substitute for gumbo file? Can't seem to find it anywhere. 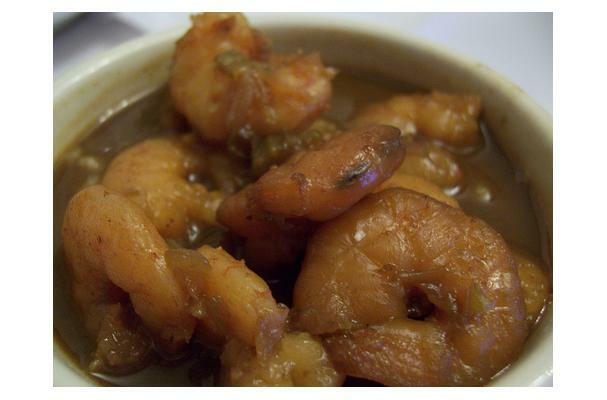 I tried this recipe leaving out the gumbo file (I also couldn't find it anywhere), and it still came out great. I just added a bit more flour to thicken the stew. I also modified the recipe by starting with a standard roux (butter + flour), sauteed the bacon separately, and then added it to the roux. The first time I tried a roux from bacon grease alone, there wasn't quite enough grease to make the roux and the roux burned. Look for file powder in specialty stores or online. The okra and the roux will thicken the consistency enough if you can't locate any file.